Goodman, Nicole and Leah C. Stokes. In press. “Reducing the Cost of Voting: An Empirical Evaluation of Internet Voting’s Effect on Local Elections.” British Journal of Political Science. Goodman, Nicole. In press. “The Conditional Duty to Vote in Elections.” Electoral Studies. Goodman, Nicole, Michael McGregor, Jérôme Couture and Sandra Breux. 2018.“Another Digital Divide? Evidence that Elimination of Paper Voting Could Lead to Digital Disenfranchisement.” Policy & Internet. Available on Early View. Couture, Jérôme, Sandra Breux et Nicole Goodman. 2017. Le vote par Internet augmente t-il la participation électorale? in Hugo Loiseau et Elena Waldispuehl Eds., Cyberespace et science politique de la méthode au terrain, du virtuel au réel. Presses de l’Université du Québec. Goodman, Nicole. 2017. “Private Over Public: A Conservative Approach to Interest Advocacy” in Joanna Everitt and J.P. Lewis Eds., The Blueprint: Conservative parties and their impact on Canadian politics. University of Toronto Press. Gabel, Chelsea, Karen Bird, Nicole Goodman and Brian Budd. 2017. “Digital Technology and First Nations Participation and Governance.“ Canadian Journal of Native Studies, 36/2:107-127. Goodman, Nicole, Karen Bird and Chelsea Gabel. 2017. “Towards a More Collaborative Political Science: A Partnership Approach.” Canadian Journal of Political Science, 50/1:201-218. Breux, Sandra, Jérôme Couture, and Nicole Goodman. 2016. “Fewer Voters, Higher Stakes? The Applicability of Rational Choice for Voter Turnout in Small Quebec Municipalities.” Published in First Look at Environment and Planning C: Government and Policy: 1-20. Goodman, Nicole and Jack Lucas. 2016. “Policy Priorities of Municipal Candidates in the 2014 Local Ontario Elections.” Canadian Journal of Urban Research, 25/2:35-47. Gabel, Chelsea, Nicole Goodman, Bird, Karen, and Brian Budd. 2016. “What Does Internet Voting Mean for First Nations? A Case Study of Whitefish River First Nation.” The International Indigenous Policy Journal, 7/3:Article 3. Kamenova, Kalina and Nicole Goodman. 2015. “Public Engagement with Internet Voting in Edmonton: Design, Outcomes, and Challenges to Deliberative Models.” Journal of Public Deliberation, 11/2: Article 4. Goodman, Nicole. 2014. “Internet Voting in a Local Election in Canada”, in Internet and Democracy in Global Perspective, Studies in Public Choice 31, Eds. Bernard Grofman, Alex Trechsel, and Mark Franklin, Springer Verlag. Goodman, Nicole, Heather Bastedo, Lawrence LeDuc, and Jon H. Pammett. 2011. “Young Canadians in the 2008 Federal Election Campaign: Using Facebook to Probe Perceptions of Citizenship and Participation.” Canadian Journal of Political Science, 44/4:1-23. Goodman, Nicole. 2010. “Internet Voting in Canadian Municipalities: What Can We Learn?” CEU Political Science Journal, 5(4): 492-520. Krimmer, Robert, Melanie Volkamer, Jordi Barrat, Josh Benaloh, Nicole Goodman, Peter Y. A. Ryan, and Vanessa Teague. 2017. Electronic Voting: First International Joint Conference, E-Vote-ID 2016, Bregenz, Austria, October 18-21, 2016, Proceedings, Lecture Notes in Computer Science, Springer, Berlin. Goodman, Nicole and Rodney Smith. 2017. “Internet Voting in Sub-national Elections: Policy Learning in Canada and Australia.” In Robert Krimmer, Melanie Volkamer, Jordi Barrat, (et.al. ): Electronic Voting: First International Joint Conference, E-Vote-ID 2016, Bregenz, Austria, October 18-21, 2016, Proceedings, Lecture Notes in Computer Science, Springer, Berlin. Goodman, Nicole and Jon H. Pammett. 2014. “The Patchwork of Internet Voting in Canada.” Electronic Voting: Verifying the Vote (EVOTE), 6th International Conference Proceedings, IEEE. Midzain-Gobin, Liam, Nicole Goodman, Chelsea Gabel and Karen Bird. 2017. “Time for change? Reforming the Indian Act to allow for online voting.” Policy Options, October. Goodman, Nicole. 2016. “Electoral Reform and Online Voting.” Policy Magazine, November/December. Goodman, Nicole and Nicole Wellsbury. 2015. 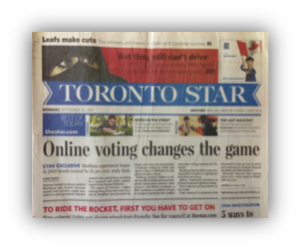 “Internet Voting Development in Ontario: Time for Overarching Standards.” Public Sector Digest, November. Gabel, Chelsea, Nicole Goodman, and Karen Bird. 2014. “The Impact of Digital Technology on First Nations Participation and Governance.” Centre for e-Democracy Journal, 1(1). Kamenova, Kalina and Nicole Goodman. 2013. “A New Participatory Policy Model: The Edmonton Citizens’ Jury on Internet Voting.” Canadian Parliamentary Review, 36(2): 13-20. Goodman, Nicole, Joan DeBardeleben, and Jon H. Pammett. 2010. “Internet Voting: The Canadian Municipal Experience.” Canadian Parliamentary Review, 33(3): 13-21. Yesterday, Today, and Tomorrow. Quebec: CEDEC. Goodman, Nicole. 2017. “Online Voting: A Path Forward for Federal Elections in Canada.” Ottawa: Privy Council Office. Goodman, Nicole and Heather Pyman. 2016. “Understanding the Effects of Internet Voting on Elections: Results from the 2014 Ontario Municipal Elections.” Toronto: Centre for e-Democracy. Full report can be downloaded from the Centre website. Goodman, Nicole and Jon H. Pammett. 2014. “Summary of the EVOTE 2014: Verifying the Vote, Ten-Year Anniversary Conference.” Prepared for Elections Canada. Pammett, Jon H. and Nicole Goodman. 2013. “Consultation and Evaluation Practices in the Implementation of Internet Voting in Canada and Europe.” Prepared for Elections Canada. Goodman, Nicole. 2013. “City of Guelph Report on Electronic Voting Options.” Prepared for City of Guelph. Goodman, Nicole. 2012. “Internet Voting Issues Guide.” Prepared for City of Edmonton. Goodman, Nicole. 2011. “eDemocracy and Citizen Engagement: The Delvinia Report on Internet Voting in Town of Markham.” Prepared for Delvinia. *Report findings featured on the front page of the Toronto Star. Goodman, Nicole, Jon H. Pammett and Joan DeBardeleben. 2010. “A Comparative Assessment of Electronic Voting.” Prepared for Elections Canada. Paper Voting Report Results in Wasauksing First Nation, 2018. Summary of Internet Voter Survey Results in Wasauksing First Nation, 2018. First Nations Digital Democracy Partner Newsletter, 2017. Wasauksing First Nation Newsletter article, January 2017. Wasauksing First Nation Newsletter article, December 2016. Wasauksing First Nation Newsletter article, November 2016. Wasauksing First Nation Newsletter article, August 2016. Summary of Paper Ballot Survey Results in Whitefish River First Nation, 2016. First Nations Digital Democracy Partner Newsletter, 2015. Internet Voting Project Mini-Summary for the Township of Addington Highlands, 2014. Internet Voting Project Mini-Summary for the Town of Ajax, 2014. Internet Voting Project Mini-Summary for the Township of The Archipelago, 2014. Internet Voting Project Mini-Summary for the Municipality of Brockton, 2014. Internet Voting Project Mini-Summary for the City of Brockville, 2014. 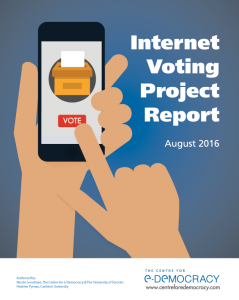 Internet Voting Project Mini-Summary for the City of Burlington, 2014. Internet Voting Project Mini-Summary for the City of Cambridge, 2014. Internet Voting Project Mini-Summary for the Township of Carling, 2014. Internet Voting Project Mini-Summary for the Municipality of Central Huron, 2014. Internet Voting Project Mini-Summary for the Town of Cobourg, 2014. Internet Voting Project Mini-Summary for the Town of Deep River, 2014. Internet Voting Project Mini-Summary for the Township of Frontenac Islands, 2014. Internet Voting Project Mini-Summary for the City of Greater Sudbury, 2014. Internet Voting Project Mini-Summary for the Town of Grimsby, 2014. Internet Voting Project Mini-Summary for the City of Guelph, 2014. Internet Voting Project Mini-Summary for the Municipality of Huron East, 2014. Internet Voting Project Mini-Summary for the Township of Huron-Kinloss, 2014. Internet Voting Project Mini-Summary for the Town of Innisfil, 2014. Internet Voting Project Mini-Summary for the City of Kenora, 2014. Internet Voting Project Mini-Summary for the Town of Kingsville, 2014. Internet Voting Project Mini-Summary for the Township of Laurentian Valley, 2014. Internet Voting Project Mini-Summary for the Municipality of Leamington, 2014. Internet Voting Project Mini-Summary for the Municipality of Lucan-Biddulph, 2014. Internet Voting Project Mini-Summary for the City of Markham, 2014. Internet Voting Project Mini-Summary for the Township of McKellar, 2014. Internet Voting Project Mini-Summary for the Municipality of Middlesex Centre, 2014. Internet Voting Project Mini-Summary for the Township of Minden Hills, 2014. Internet Voting Project Mini-Summary for the Township of Mulmur, 2014. Internet Voting Project Mini-Summary for the Township of North Dundas, 2014. Internet Voting Project Mini-Summary for the Township of North Frontenac, 2014. Internet Voting Project Mini-Summary for the Township of North Glengarry, 2014. Internet Voting Project Mini-Summary for the Township of North Stormont, 2014. Internet Voting Project Mini-Summary for the Municipality of Port Hope, 2014. Internet Voting Project Mini-Summary for the City of Quinte West, 2014. Internet Voting Project Mini-Summary for the Township of Shuniah, 2014. Internet Voting Project Mini-Summary for the Township of South Dundas, 2014. Internet Voting Project Mini-Summary for the Township of South Frontenac, 2014. Internet Voting Project Mini-Summary for the Township of South Glengarry, 2014. Internet Voting Project Mini-Summary for the Township of South Stormont, 2014. Internet Voting Project Mini-Summary for the The Municipality of Southwest Middlesex, 2014. Internet Voting Project Mini-Summary for the Town of Springwater, 2014. Internet Voting Project Mini-Summary for the Municipality of Strathroy-Caradoc, 2014. Internet Voting Project Mini-Summary for the Township of Tay Valley, 2014. Internet Voting Project Mini-Summary for the Town of Tecumseh, 2014. Internet Voting Project Mini-Summary for the Town of Wasaga Beach, 2014. Internet Voting Project Mini-Summary for the Municipality of West Elgin, 2014. Internet Voting Project Mini-Summary for the Municipality of West Perth, 2014. Paper Ballot Survey Summary Prepared for the Municipality of Guelph, 2014. Paper Ballot Survey Summary Prepared for the Municipality of Markham, 2014. Paper Ballot Survey Summary Prepared for the Municipality of Springwater, 2014. Paper Ballot Survey Summary Prepared for the Municipality of Sudbury, 2014.